Someone asked whether my bag was in fact the Superman logo. Unfortunately I'm not cool enough to resonate with Superman in any way and my satchel really is just a shiny holographic diamond. Now that's all cleared up, I love the way holographic materials bring a playful futuristic vibe to an outfit, because if statement accessories aren't so much your thing then the glare from this bag is statement enough. Great look! I love your dress! Such a cute look and the bag adds sucha fun top! I love your jewelry! 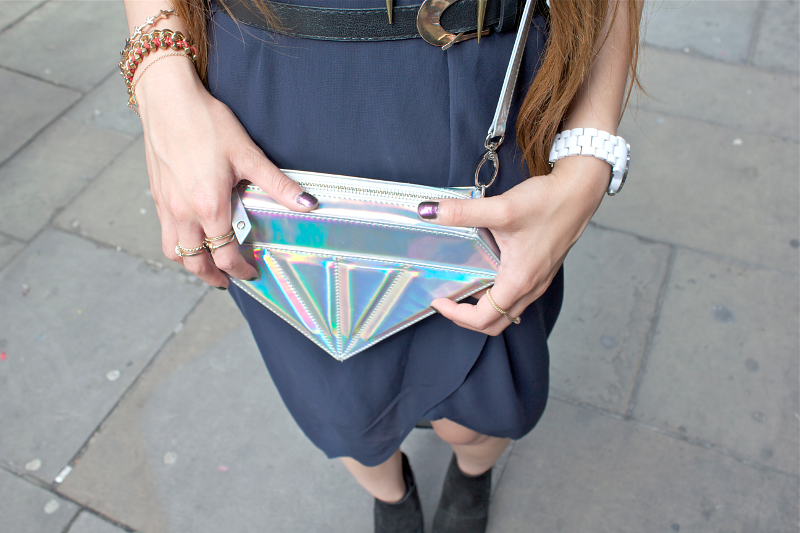 I adore the hologram bag, such a stand out piece and super cute! How cool is this? You look awesome - I love that you paired that dress with those boots, looks rad! You rock this outfit girl! You absolutely exude cool vibes! And that bag is awesome! That's such an unique bag! I love this outfit a lot. Okay, that bag is just amazing. Following you on Twitter, Bloglovin & GFC! Thats a really fun bag. That bag is so so so amazing! Love this look - that bag is amazing!! Love the slip dress, looks amazing on you! A very special outfit! Love the mix of the necklaces! Come check out my blog? Your bag is the cutest! life while styling in amazing eyewear. That holographic bag is so cute and chic, I've been on the hunt for one myself, but they are all either too big or too small. Seeing it paired so well in this outfit just makes me want one more! Your bag is so cool!! The bag is definitely enough - I love holograms! I just followed you on bloglovin by the way! :-) My links are below if you want to check them out. Love the bag! Is really pretty! !